Earex Advance Ear Drops - Dual action softens ear wax and removes it - Safe to use in Adults, Children (over 2) and the Elderly. Softens and removes ear wax. Helps prevent ear wax build up. Reduces the need to syringe. 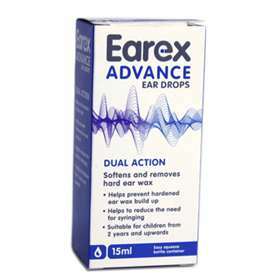 Earex Advance Ear Drops are specially formulated to soften ear wax and remove it. The glycerine in the drops hydrate the wax and the urea peroxide contains oxygen which breaks it up. Tilt your head to one side and squeeze 3-6 drops of Earex Advance into the ear. Repeat once or twice daily for the removal of ear wax, or once a week to help prevent ear wax build up. Treatment usually takes 3-4 days, after which an improvement should be noticed. GLYCERIN, UREA PEROXIDE, CHAMOMILE GLYCOLIC EXTRACT, PURIFIED WATER, PROPYLENE GLYCOL, SODIUM LAUROYL SARCOSINATE, CITRIC ACID. Do not use if your ear drum has been perforated, you have an ear infection or have had any problems with your ears. Do not use if you are sensitive to any of the ingredients.